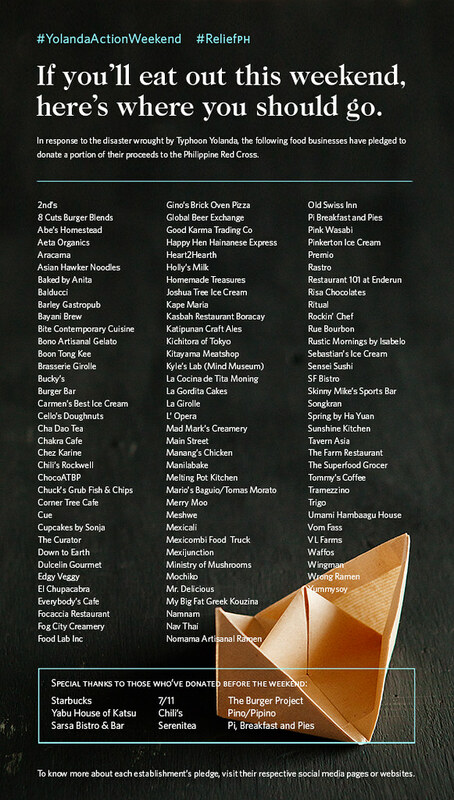 A group of generous food and beverage purveyors have banded together to offer help to the victims of typhoon Yolanda. They are pledging a portion of their proceeds this weekend, November 16 – 17, to the Philippine Red Cross. Over a 100 kind souls have committed themselves to this initiative, started and spearheaded by Mr. Delicious. I think it is a wonderful endeavour and will be showing them my support. So if you are going to eat out this weekend, may I suggest these establishments? If you’d like to share, please use the hashtags #YolandaActionWeekend and #ReliefPH so we can stay connected. Several of these vendors are ones that I usually frequent or whose products I regularly buy, so I’m more than happy that my purchases will be going further this weekend. If you’d like to donate directly to the Red Cross, you can do so HERE. I’ve also rounded up other ways to help HERE. Thanks for the info. Much love to you! This is a great way for the foodie community to help. Bravo! So good of you to put this together and post about fundraising events. I wish I was there in Manila, would have loved to try out these places, too. Stay well, J ! Thank you for the info. I hope and pray that donations flood in to help the victims. I appreciate that you guys did this for the Yolanda victims.